Zinedine Zidane is Real Madrid's current football director, but earlier this week, he witnessed his son Enzo Zidane, having his first practice with Real Madrid's first team. Enzo Zidane is only 16 years old, but he rose a lot of curiosity during his first training session and Cristiano Ronaldo insisted on following him closely. 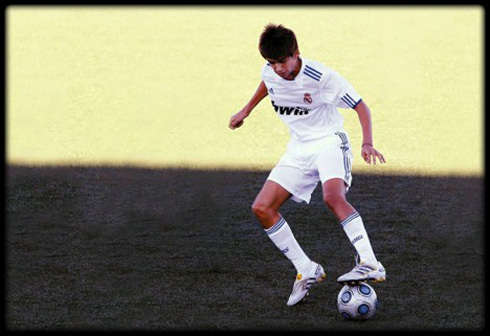 Enzo Zidane is Zinedine Zidane's son, and he currently plays for Real Madrid youth cathegories. Howevever, this last Tuesday, Enzo had the chance to train for the first time with Real Madrid's first team and he had a teammate who kept him under his radar all the time: Cristiano Ronaldo. Enzo Zidane is only 16 years old, but he has already shown a few skills that make all football fans immediatly remember his dad. This opportunity was granted due to the fact that many Real Madrid players were still on duty for their respective National Teams. Therefore, José Mourinho decided to call up a few youngsters and Enzo Zidane made his debut, training with a few Real Madrid star players, such as Cristiano Ronaldo, who returned earlier because Portugal only had to play one match last week (0-4 win against Cyprus). Another point of interest during this week's training sessions has to do with Ricardo Carvalho and Pepe meeting again, after the Portuguese National Team incident last week. From that awkward situation, on which Paulo Bento (Portugal coach) called Ricardo Carvalho a deserter, the Portuguese defended himself by calling Paulo Bento a mercenary and saying a few days after, that he couldn't understand how players such as Pepe could immediatly become a first choice for Portugal, just after they arrived to camp, with a few days of delay from the rest of the teammates. Ricardo Carvalho confessed he felt disrespected for what happened in those circumstances and decided to leave the Portuguese National Team. However, Pepe and Ricardo Carvalho came back to Madrid this week and started training together again, showing they still preserve a good friendship. Cristiano Ronaldo acted a bit like a peacemaker in this situation, by joining his two teammates during some of the talks. Real Madrid next match in La Liga will be against Getafe, this Saturday, the 10th of September. You can watch Real Madrid vs Getafe live streams, in our Live Games Streams section. Cristiano Ronaldo will be on the line-up in this game that will be played in the Santiago Bernabéu. The countdown clock timer, displaying the time left for the next Ronaldo game, is shown on the top right corner of all pages.